(Please contact for pricing) Noise has become a very important problem in Western Canada. Growth surrounding cities in Western Canada from the downtown core to the outskirts is increasing in congestion and traffic noise. Escaping to the suburbs is no answer as the traffic noise is everywhere. This noise is causing many sleepless nights!! This is creating much unnecessary stress for many of us!! Fortunately bQuiet Soundproof windows has a Canadian made solution. No matter where you live; Calgary, Edmonton, Lethbridge, Red Deer, Vancouver, Victoria, Kelowna, Saskatoon, Regina or Winnipeg, this soundproof window is your best solution for reducing unwanted exterior noise! Our soundproof window is very simple to install. It arrives with do it yourself instructions and all the necessary materials for easy installation. 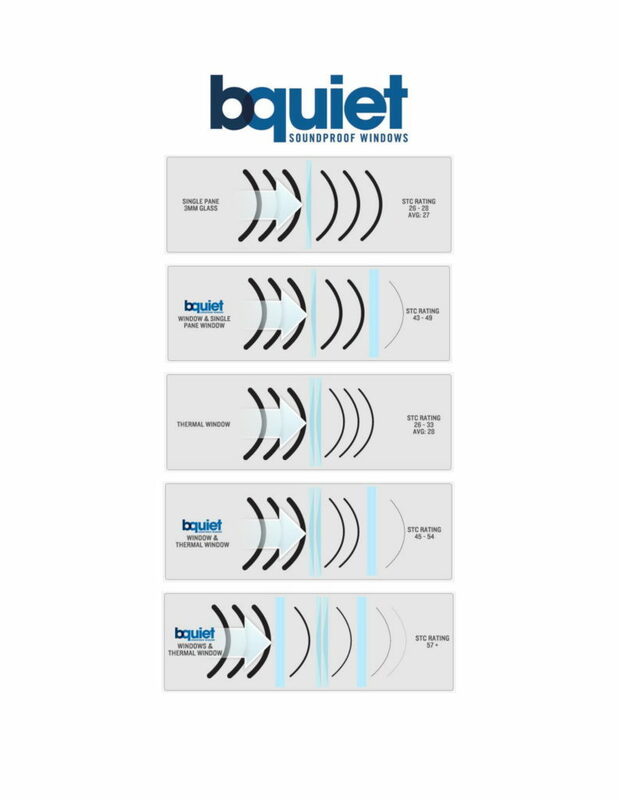 The bQuiet window system is a second window placed behind or inside your existing window. This allows for original windows to be kept, preserving the exterior look and complies with any regulations condo and townhouse owners face. 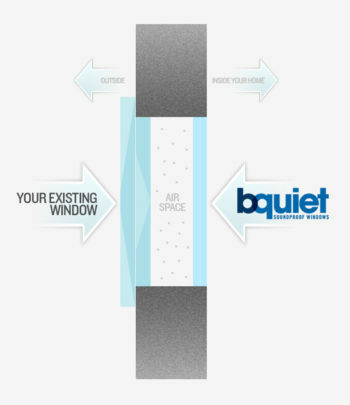 The bQuiet Soundproof window will significantly reduce noise generally 75%-90% and still keeps the functionality of opening and closing your existing windows. Any home, condominium or commercial offices that suffer from excessive noise because of their vicinity to a busy street, railway tracks, airport flight path or noisy neighbors will greatly benefit from the installation of a bQuiet Soundproof window. If unwanted noise is your only problem, then bQuiet soundproof windows offers the option to solve your soundproofing problems. Our soundproof window system is a second window placed behind or inside your existing window. The bQuiet window will open and close with your existing windows. With our windows, there is no need to remove or replace your existing windows. This allows you to maintain the exterior look of your home or condo, which is especially important for condo owners who have restrictions. Why should the windows have all the fun? bQuiet sliding glass doors are able to reduce noise just as effectively as our windows; 75-90%. As we do with windows, we add a 2nd layer to your sliding door – a 2nd glass layer that is laminated, blocking sound and adding security. The coldest room in your home is typically the one with the sliding glass door due to the glass itself and the non-sufficient seals that typically surround them. With our 2nd glass door added, drafts are virtually eliminated, thus changing the room to one of the most comfortable in the entire home. bQuiet Soundproof windows & sliding glass doors provide another substantial benefit. Because we use laminated glass, security is increased significantly! Sliding glass doors normally have tempered glass, which can be easily broken by an intruder. The laminated glass offers excellent security and peace of mind by preventing break-ins. Due to the time required and the noise produced attempting to break through, the effort required to break them deters many intruders. Laminated glass also offers the advantage of protecting interiors from flying glass, projectiles and other damage because they remain intact when struck. A bQuiet Soundproof window or sliding glass door is a second window/door that is placed on the inside of your existing window/door. It consists of acoustical laminated glass and heavy gauge aluminum frames that adapt to any interior. Think of it as a sophisticated storm window. In rare situations it can be mounted on the outside also. The goal is to mount the soundproof window at least 3-4 inches away from the glass of the existing window. Sound reduction is achieved with density and space. The further away the soundproof window is placed, the greater the sound reduction. For example, a soundproof window that is located 4 1/2″ away from the existing window has a 3-5 point higher STC rating compared to one that is located 2 1/2″ away. Unwanted noise causes restless sleep, lack of sleep, higher stress levels and discomfort. More and more is being discovered about the harmful effects of unwanted noise in our home or work environment. Installing bQuiet Soundproof windows/doors will reduce this unwanted noise and virtually eliminate the stress. 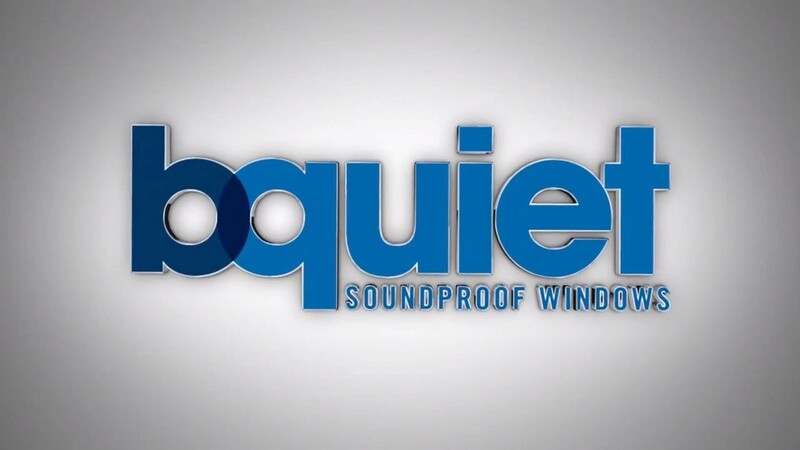 bQuiet Soundproof windows/doors reduce noise by 75-90%. Imagine how much better you can sleep if your windows/doors could eliminate the outside noise that keeps you and your family awake at night. No more waking up tired every morning. bQuiet Soundproof windows/doors are a second window/door placed behind or inside your existing window, there’s no need to remove or replace your existing windows. Real estate in noisy areas sells for less and doesn’t appreciate in value compared to quieter locations. By adding bquiet soundproof windows, many of our clients have restored the value of their properties compared to their quieter counterparts. One such case study is a couple that purchased a beautiful town house in Calgary, Alberta – an end unit next to a busy street. The Purchase price in 2009 was roughly $30,000 less than the same size townhomes away from the traffic. The couple contacted us and we installed our bQuiet windows on the second floor, providing peace and tranquility in the bedrooms. A year later in 2010 the couple had to re-locate and sold their Calgary townhome home for 25% more than the purchase price in 2009. The new value was closer to the same townhouses located further away from the traffic in the quieter zone. Another example is a home in Vancouver that had to be listed for $40,000 less than the neighbour across the street in a smaller house. The listed house backed on to a busy street, which was widened to 4 lanes a few years prior. The owner had our bQuiet windows installed and decided to stay, he can now confidently list his home for the same price as his neighbour’s across the street.